21 years ago several Stormy Petrels flocked to Seattle to attend the 1st annual International Holmesian Games hosted by “The Sound of the Baskervilles” or, as they are often lovingly referred to, the SOB’s. Since that time, and four more International Holmesian Games, the Petrels have had many opportunities to share special events with the SOB’s on both sides of the border, and we are truly pleased and honoured to call our colleagues in Seattle our good friends. A good time was had by all! 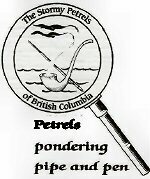 The Stormy Petrels of BC wish to congratulate the Sound of the Baskervilles as they celebrate, on March 31st, 30 years as a Sherlockian society. May the next 30 years be filled with much jollification!